It used to be that if you wanted to be successful as an Artist, you would submit samples of your paintings to the Official Salon, in Paris. There, official “art experts” could make or break your artistic career by accepting or refusing your work. Almost the only way an artist could become well known in those days was to have their paintings shown in the great Salon. People came to the Salon from all over the world, to see what the best artists in the world were doing. Starting in 1863, the Salon des Refuses, in Paris, showed the work of artists who had been rejected by the official Salon. 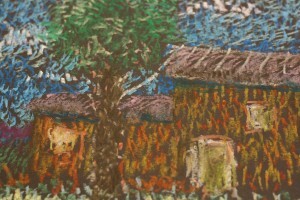 People found these artist’s rough painting techniques and haphazard colored patches alarming. In 1874, Claude Monet exhibited a painting called Impression, Sunrise with some other “refused” artist friends. 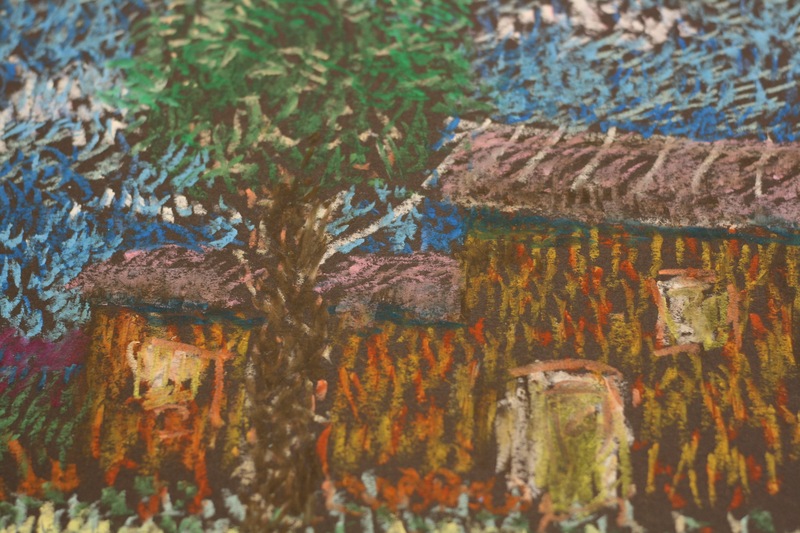 The work was criticized for being “just an impression,” or an unfinished picture. This was meant to be an insult but the artists adopted the word as a name for their group and called themselves “IMPRESSIONISTS”. Monet became one of the greatest painters of this art movement. For additional information about Impressionism see Rotation #1, Packet 14. Renoir—Impressionism. People in Paris during Monet’s time thought paintings should be clear and sharp, like a photograph might look today. They felt art should be a mirrored picture of what a person would see in real life. They also used a lot of dark, moody colors. Monet and his artist friends were more interested in how pretty something looked when the sunlight was on it. They liked to paint ordinary things like a boat on a lake, rocks by the ocean or haystacks in a field. They painted things outside in nature. Monet’s style of painting was called “Impressionism”. It used to be that if you wanted to be successful as an Artist, you would submit samples of your paintings to the official Salon, in Paris. There, official “art experts” could make or break your artistic career by accepting or refusing your work. Starting in 1863, the Salon des Refuses, in Paris, showed the work of artists who had been rejected by the official Salon. 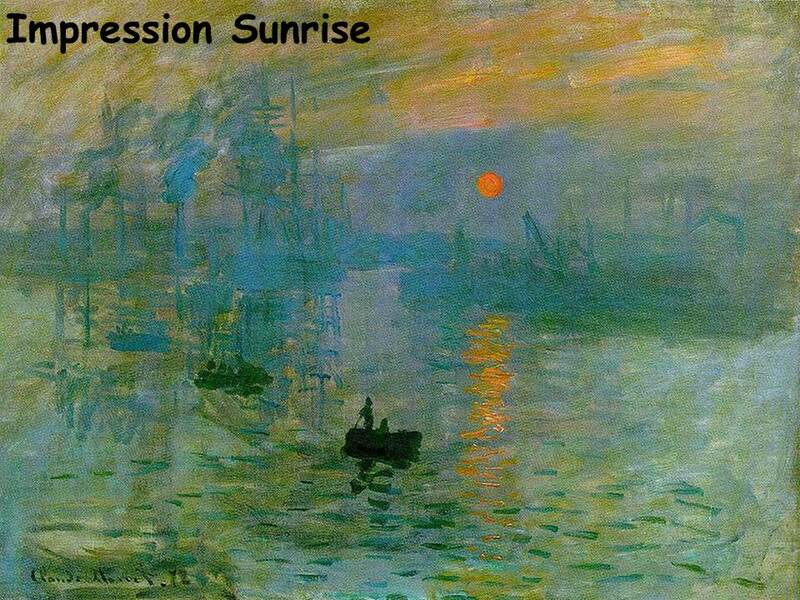 In 1874, Claude Monet exhibited a painting called Impression, Sunrise. It was very different from the artistic style most people of that day were used to. An art critic called most of the Salon des Refuses artwork “impressionism”, meaning the paintings were only partly finished, just a rough “impression” of the finished pictures they should have been. He coined the word based on Monet’s title for his sunrise painting. This was meant to be an insult but the artists adopted the title as a name for their group. Although some people didn’t like Monet‘s impressionistic pictures, he kept on painting them. He felt it was important to show scenes of everyday life. He tried to make the colors, shadows and light as real as possible. But the details of his paintings just weren’t as clear as other artists. If you take a very close look at one of Monet’s paintings, it just looks like a bunch of colorful brush strokes or “blobs”. When you step away, the painting will start to make sense. (Pass some paintings around. Have students look at them very closely, and then pull the pictures farther away). Point out the sunlight reflected on the water below the sun. Point out the way the picture is divided into three BANDS OF COLOR—light blue in the FOREGROUND, a darker VALUE of blue in the center, and the sky, which is blue near the horizon line and changes color in the highest are of the picture. 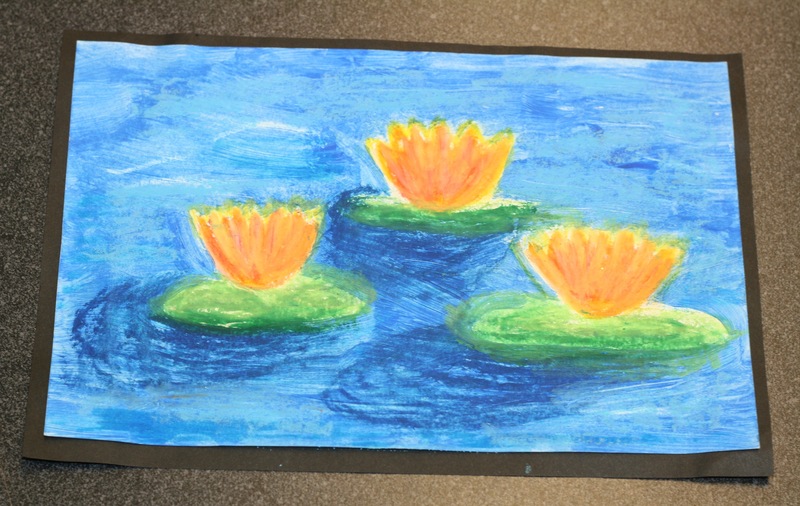 • Draw and paint a Seascape using a cotton swab or a pencil eraser to create small “dabs” or “blobs” of color. Paint TINTS and SHADES of blues and greens in the water. The paint shouldn’t be “brushed”. “Blot” small dabs of the SHADES and TINTS of blues and greens closely together until they look somewhat solid. Add a few lavender dabs too. Use white and lighter TINTS of blue for the sky. Create a sunrise by adding orange and/or yellow TINTS. When Claude Monet was little, his family moved from Paris to the Seaport town of Le Havre. At Le Havre, ships from all over the world stopped to pick up supplies before their long trips. Monet’s father owned a store there that sold supplies to the sailors and shipping companies. 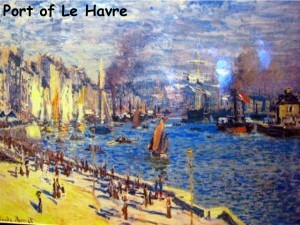 A well-known artist of those days lived in Le Havre. His name was Eugene Boudin (boo-DAN). He convinced Claude that he should try painting. Boudin had some new and interesting ideas about painting that Monet liked. He thought artists should paint outside, not in stuffy studios the way most artists of Monet’s time did. Monet loved the idea of painting outdoors. Monet experienced colors and light as he had never seen them before. From then on, the outdoors became his studio. Despite the weather conditions, Monet hauled his canvasses through fields, sand, wind, snow and rain; once, Claude was even swept underwater while he was painting a Seascape. 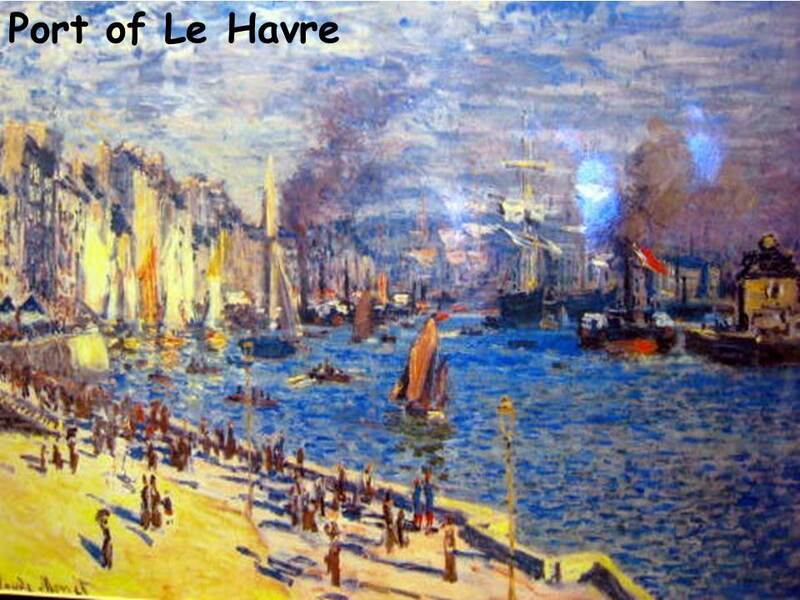 In 1862, Monet left Le Havre to study Art in Paris. 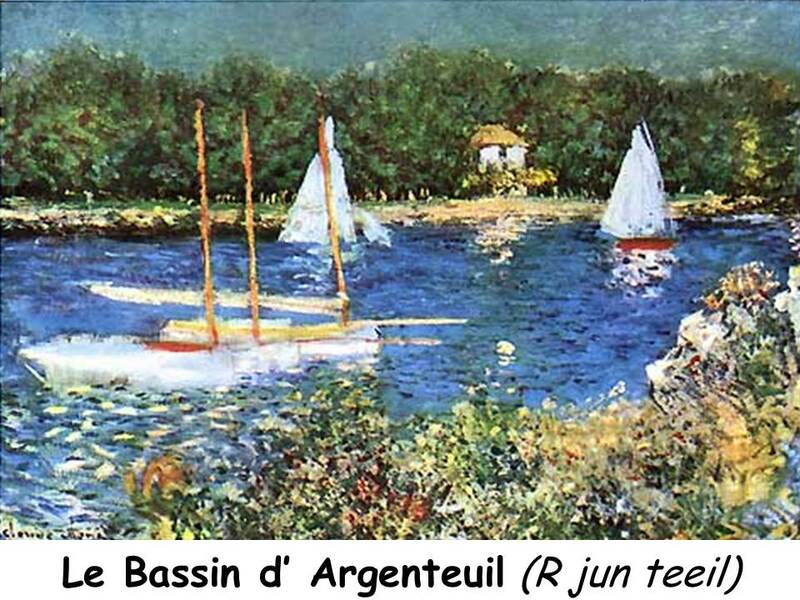 Who knows, if Monet’s father had not decided to move to Le Havre and Monet had not met the artist Eugene Boudin, maybe this strange new style of art (IMPRESSIONISM) would never have become so popular! How many boats can you see in the water? Are the boats easy to see? No, they are roughly painted to give the “impression” of boats. It is hard to give an exact count of the number of boats because of this. There are quite a few sailboats but can you see the larger ships with tall masts? They are farther behind the sailboats. They are in the right MIDDLE GROUND of the painting, to the right. Their sails are rolled up on the masts. Can you see the people? These are only VERTICAL LINES of color yet we can tell they are people. You can see ladies with large hats and some with umbrellas. It is a sunny day so most of the people are casting a shadow on the ground behind them. Can you find any of the shadows cast by the people on the shoreline? These are diagonal blue lines to the left of the various people These shadows give us clues to where the sun is shining from. Who can tell us where the sun is in the picture? Because the shadows are long we can tell the sun is low in the sky, towards the right of the picture. One special thing that Monet did different from other artists was to use color, instead of black paint, to represent shadows. He often created his shadow effects using COMPLEMENTARY COLORS. Can you find the buildings in this picture? They are in the MIDDLE GROUND also. There is a building on the far right and many other buildings on the far-left, in the MIDDLE GROUND. In the FOREGROUND on the left is the shore. • Paint a picture of sailboats on water. 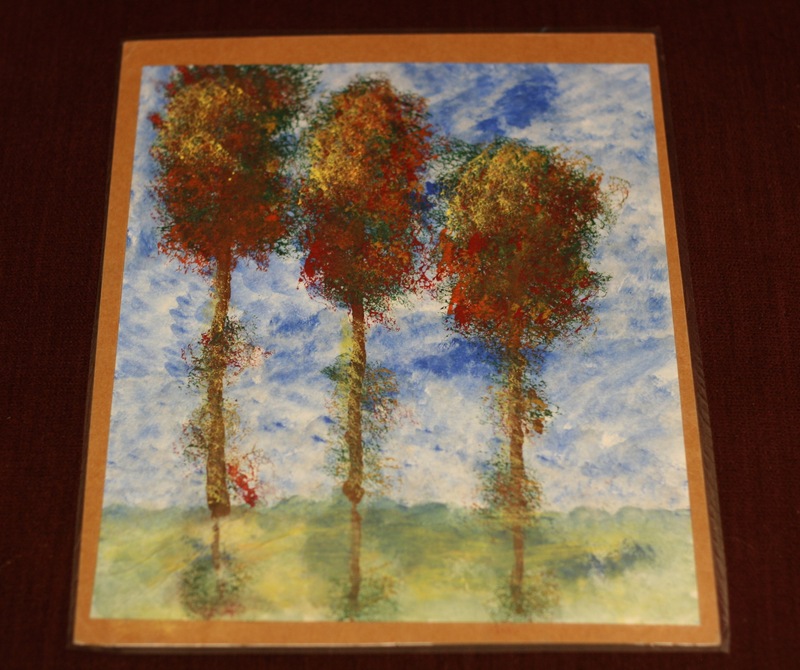 • On the top portion of horizontal paper, use “blobs” of white and blue paint to create an impressionist sky. 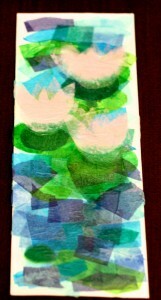 On the bottom section, use blue, green, violet (cool colors) “blobs” of paint to create impressionist water. Make sure that your horizon line is either higher or lower than the center of your picture. Swirl your paintbrush to create MOVEMENT in the water and the sky. When the paint dries, glue white triangles on the HORIZON LINE to create sailboats on the water. Cut rectangles for buildings out of several colors of paper. Windows for the buildings could be glued on using gray or white paper. • Create a color wheel so the kids can readily identify complementary colors. Explain that colors opposite on the wheel are COMPLEMENTARY. If you look very closely at some of Monet’s paintings, you can hardly tell WHAT he painted. It just looks like a bunch of colorful “blobs” of paint. There are usually several colors of paint in an area that looks (from a distance) like it is only one color. Claude Monet loved the way colors reflect in water and the special way that water makes clouds and the sky look. Many of his paintings are pictures of water. 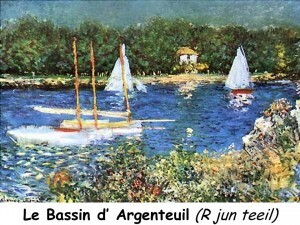 Boats, oceans, ponds and lakes were some of his favorite subjects to paint. 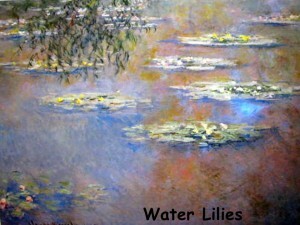 • Make a watercolor and raindrop picture in honor of Claude Monet’s love of water and its reflections. This project will only work if it is a rainy day. Have kids paint an entire piece of white construction paper with watercolor. They could paint their paper entirely blue or get a little impressionistic using other COOL colors (green, purple, and turquoise), even adding a little pink. There shouldn’t be any pattern to these colors, just make sure they cover the ENTIRE page quickly. After the papers are completely covered with color, let them dry. When they are completely dry, take the painted papers outside and lay them in a safe place to be rained on. If it is raining hard enough, just walk the kids outside, with their papers in their hands, for a few seconds. The pages shouldn’t be soaking wet, just add some drops of rain. Bring the papers inside and sprinkle the wet drops with salt, then set aside to dry. After they are completely dry, brush the salt off and discover the patterns it has created. If your school has a die cut machine with a die of an umbrella, cut some assorted colored umbrella shapes out ahead, in assorted colors, and have the kids glue an umbrella or two on their raindrop designs. You could also cut out plain white umbrellas and let the kids decorate these before gluing them on their paper. • If it’s a sunny day, use a spray bottle for the project above. Claude Monet organized the color in his gardens the same way he organized color in his paintings. His gardens were filled with bright, brilliant color. (Grade 4-5) This pathway through the flowers is wider at the front (FOREGROUND) and narrows as it moves back in the picture, toward the building in the far distant BACKGROUND. This is an example of ONE POINT PERSPECTIVE. The VANISHING POINT is where the perspective lines of the pathway edge meet on the building window at the top of the steps. Why are the two children on the stairway so much smaller? This artistic technique helps create the illusion that these two children are farther away from us than the child at the bottom of the stairs, who is larger. There is no way of knowing, simply by their sizes, which of the children is older or younger. 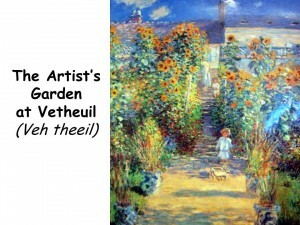 • Have students draw and color or paint a picture of a flower garden. For younger students, you might draw some assorted flower shapes and assorted leaf shapes on the board for inspiration. 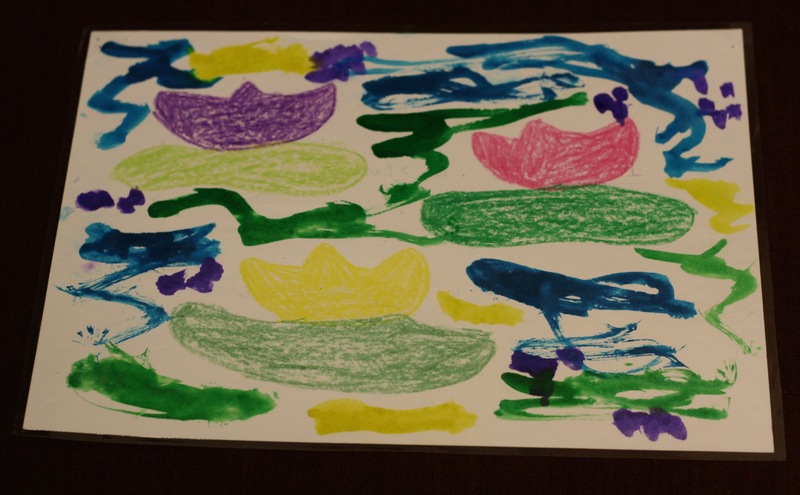 • Make flower gardens using color crayons to draw the stems and tissue paper for the top. 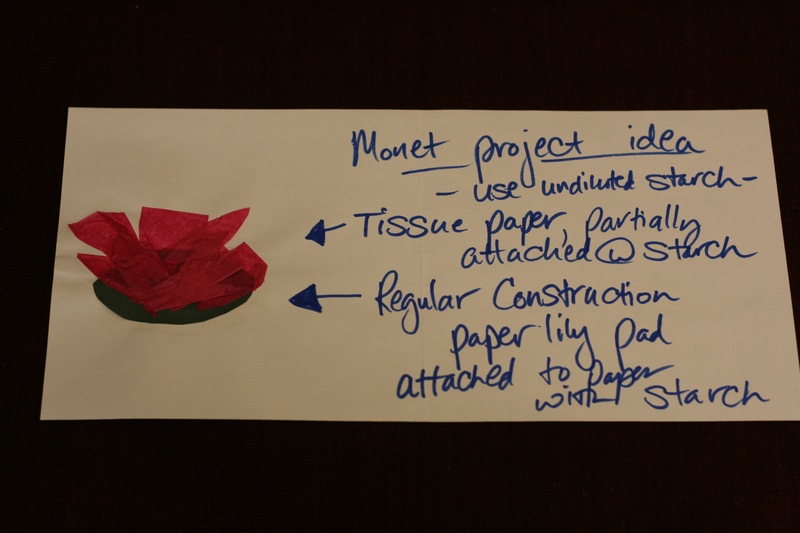 Tissue squares could be wrapped around a pencil eraser and glued in a three dimensional style. 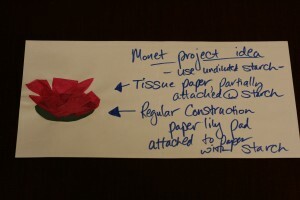 Tissue could be torn in small, more abstract shapes (resembling “blobs” of impressionist color) and painted with liquid starch, or watered down Elmer’s glue, to lay flat. Blobs of color, on top of a green stem with leaves, will create impressionist flowers easily. 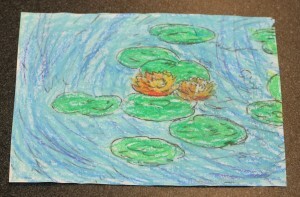 • (Grade 4-5) Draw and paint a flower garden with a pathway that uses one-point perspective. A water fountain or birdbath might create a good VANISHING POINT at the back of the pathway (near the top of the paper) for a garden picture. Monet lived most of his life in debt. 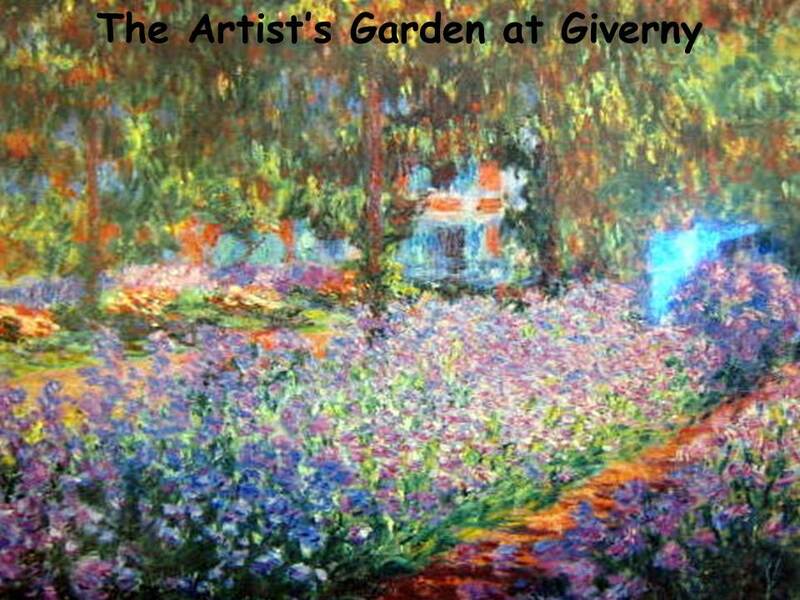 Finally, in 1890, he was finally financially stable enough to buy the home in Giverny (Jzee-VER-nee) that he was living in. The beautiful gardens he built there are still being taken care of today and if you ever go to France, you can walk through these gardens and see what Monet saw when he was inspired to paint them. The pink house that Monet lived in here is now a museum (Show photograph) displaying some of Monet’s personal things and paintings. The house is maintained and still painted on the exterior in the same colors as when Monet lived there. • Make flower gardens with cut construction paper glued on a background. • (K-1) Make a cupcake wrapper flower. 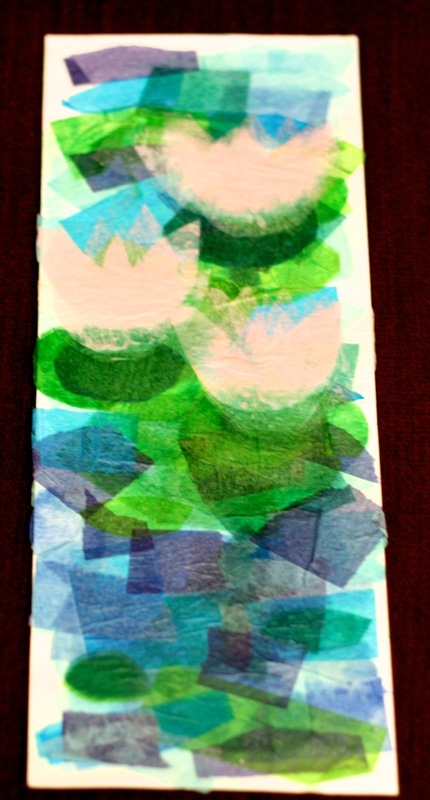 Cut a stem and leaves from green construction paper and glue these to a blue background paper. Flowers can be a few (3-5) cupcake wrappers, glued on top of each other (show class how to make it fluffy by flattening the bottom wrappers). Glue on a green center. For a Daffodil type flower, glue a yellow sun or long flower petal shape at the top of the stem. Glue a yellow cupcake wrapper in the center of this shape. Two cupcake wrappers will also work. In 1890, Monet also bought a tract of marshland across the road from his Giverny (Jzee-VER-nee) farmhouse. A small stream flowed through this land. 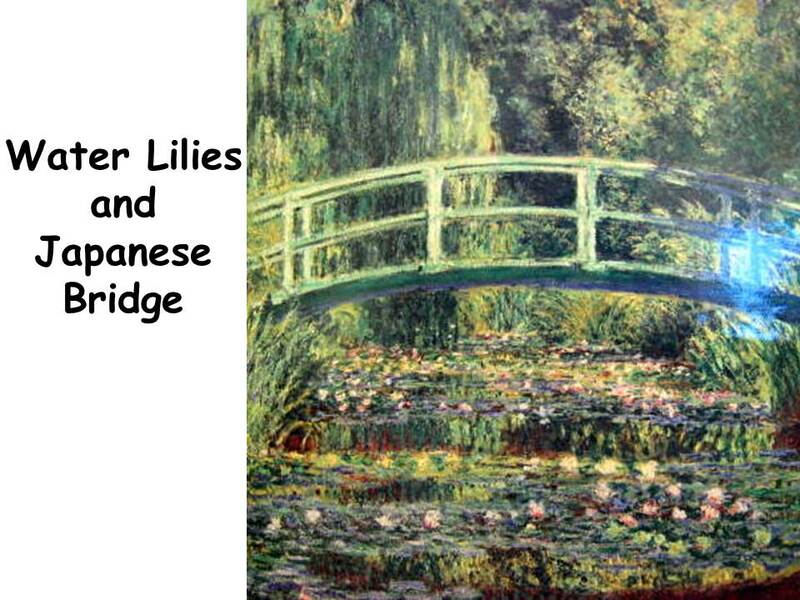 Monet hired workmen to divert the stream and construct a pond, spanned at one end by a Japanese bridge with a trellis over it. He planted weeping willow trees, bamboo and iris around the pond. Clusters of lily pads floated on the water. Some types of the lily pads in his pond were very rare and unusual. 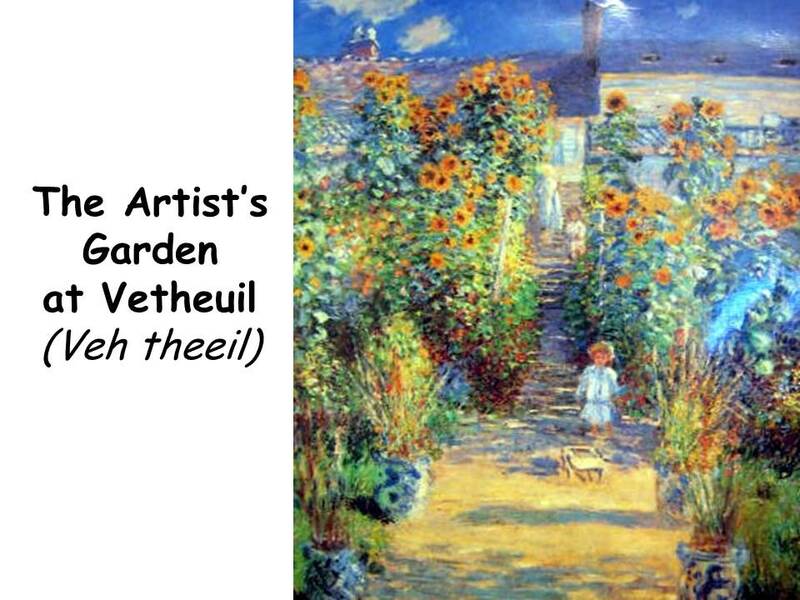 Claude Monet hired an army of gardeners to care for his beautiful gardens. There are many greens in this painting—ANALOGOUS COLORS green, blue-green, yellow-green, DARK VALUE green SHADES (Monet did not add black to create his shades—he never used black—but very dark blue), LIGHTER VALUE green TINTS (white added). Besides green, what other COLORS can easily be seen in the painting? There are blues and lavenders in the water and under the curve of the bridge but these are very difficult to see. 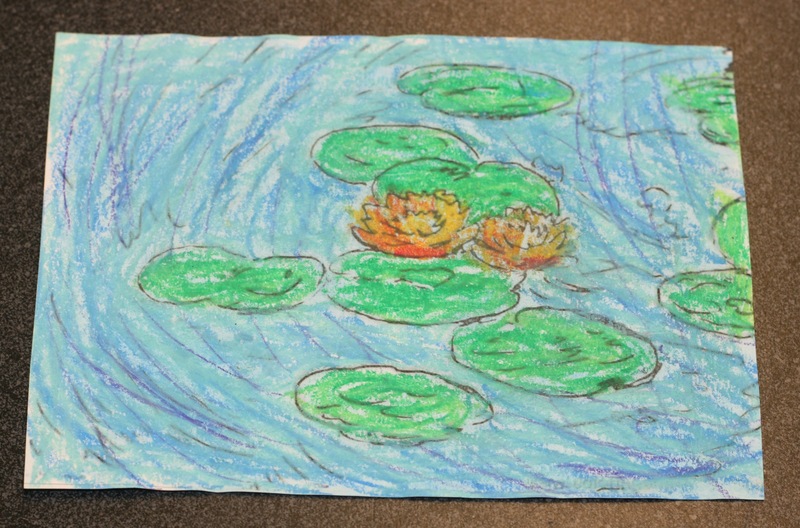 The water lilies have pink flowers and yellow flowers. There are horizontal bands of red vertical stripes in the water, placed close together. These bands create an illusion that the water drops or falls lower as it moves towards the FOREGROUND. 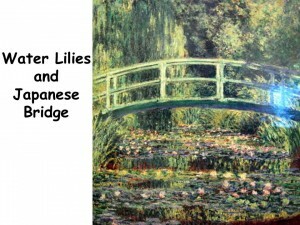 • Have students draw or paint a Japanese Bridge picture. Point out the curve of the bridge over the water. Point out the way the railing of the bridge follows the same curved line as the base of the bridge. For most of the last 25 years of Claude Monet’s life, he worked exclusively on a series of paintings of the water lilies. Some of his water lily paintings were painted on bright sunshine days and some of them were on cloudy, misty, rainy and even foggy days. Monet could create all kinds of weather with the colors of paint that he used. 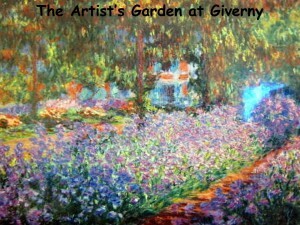 Many of the paintings he painted in Giverny (Jzee-VER-nee) are his most beautiful and famous. Water lily flowers are beautiful but they only last for one day. Before he went out to paint his water lilies, Monet would call his children and the gardeners to come and remove all the dead flowers and leaves. He felt the water lilies needed to look their best for him to paint them correctly. The Portland Art Museum owns a large Monet water lily painting that is usually on exhibit there. It is a very large painting. You can ask to see it if you visit the museum with your parents! 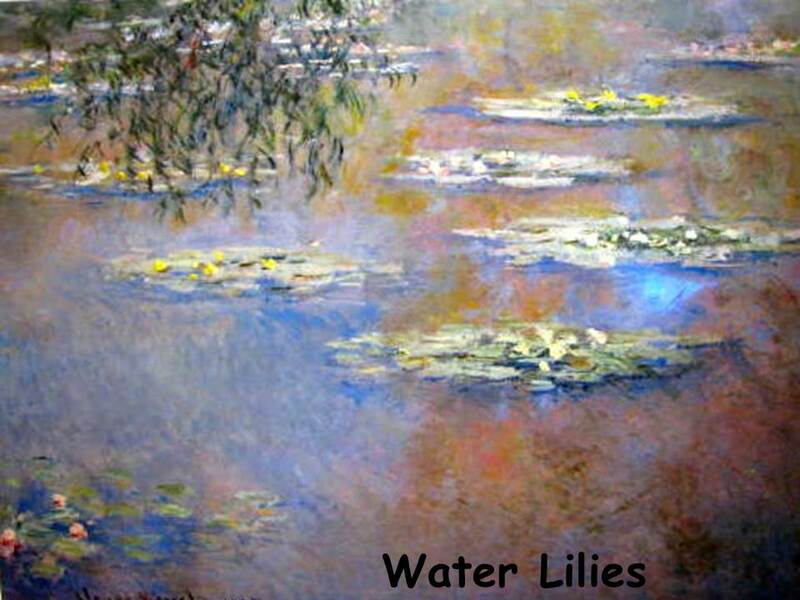 The water lilies look very different when they are several inches tall in this real Monet painted canvas, instead of the way we see the water lilies in these much smaller prints. As Monet painted his water lily garden, he kept making his pictures larger and larger. Monet had a dream to create a very large round room where people could be surrounded with his water garden. The Louvre Museum in Paris agreed to build this room for him. Monet gave the museum specific rules to follow for the room. They had to glue his watercolor paintings to the curved walls and the museum could never put any other artwork in this room. Monet also told them that they could never change the room. Some of the paintings for this room are over forty feet wide. Monet continued to work on his last canvases of water lilies until he died, in his house at Giverny, on December 5, 1926. 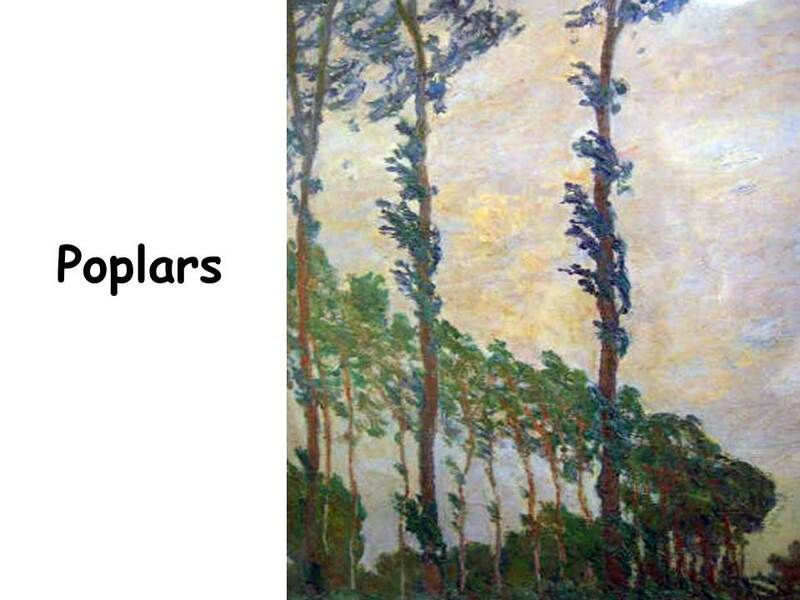 During a walk in the neighborhood of Giverny (Jzee-VER-nee), Monet was attracted by a magnificent stand of Poplar trees growing in ordered sequence along the winding Epte River. After he had begun to paint them, Monet found out they were about to be cut and sold at auction. He appealed, fruitlessly, to the mayor for a postponement of the sale. The problem was finally solved, somewhat extravagantly but with characteristic originality. Monet sought out the most probable buyer and agreed to reimburse any amount he paid over the figure he had planned to bid, on condition that he keep bidding, and that the trees be left standing until the series of paintings was completed. There are many lines in this painting. How many VERTICAL LINES can you find? The green shoreline is a wide HORIZONTAL LINE. Can you find a DIAGONAL LINE? • Paint a row of thin poplar trunks, spaced evenly apart and completely to the top edge of the paper, with brown paint. A green shoreline could be sponged in with reflected poplar trunks painted below. The leaves of the poplar trees could be sponged in along the trunk. Leaves could be Spring colors. Sponge dabs of dark green first and dab light green next. Let dabs of both shades show through. A third value of green sponged in could make the trees even more interesting. • For Fall coloring, sponge warm colors (red, orange, and yellow). Use the darkest COLOR VALUE first (red), then the MEDIUM COLOR VALUE (orange) and the LIGHTEST VALUE (yellow) last, to highlight. • Cool colors (blue, green, and purple) would look nice for painting Spring or Summer poplars. Begin with the DARKEST COLOR VALUE (purple), then the green (yellow-green for Spring trees, which would be a LIGHTER VALUE of green) and shade along one side edge by sponging with very light dabs of blue spaced farther apart.